Twenty buildings at Butler Community College (Butler) sit nestled in their El Dorado, Kan. campus. 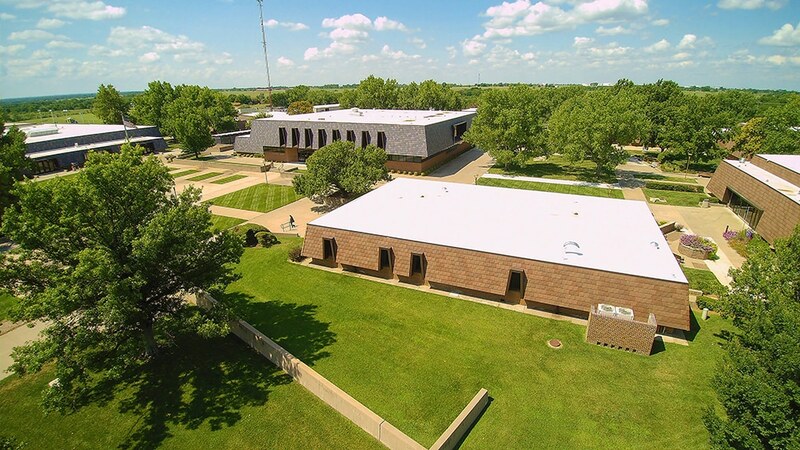 This year, 16 of those structures, containing classrooms, resource centers and student activity areas, are looking better thanks to new synthetic slate mansard roofing from DaVinci Roofscapes. Mansard roofing is generally defined as a steep (almost vertical) roof that ends with a flat roof at the high point. In some cases people think of a mansard roof as siding, since it covers so much of the structure’s exterior. Installation of the new synthetic slate roofing at Butler came as a direct result of a severe storm in 2015. 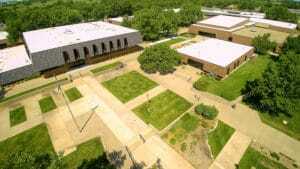 Golf ball to baseball sized hail damaged 95 percent of all the roofing on campus. “The damaged concrete and clay tile roofing had to go,” says Lynn L. Umholtz, director of facilities management at Butler Community College. “We chose the synthetic slate DaVinci tiles because they’re practically maintenance free. Larry Walty Roofing worked with Umholz and the team at Butler to find the custom color that would perfectly complement the college campus structures. Nine of the Butler structures now have DaVinci roofing consisting of a blend of Light Autumn, Medium Autumn, Dark Autumn and Dark Clay. The remaining seven buildings feature a custom color of Dark Violet, Dark Purple, Slate Gray and Smokey Gray. “I could not have asked for a better contractor to complete this large project,” says Umholtz. “Safety was the number one priority at all times for Larry and his team. The massive six-month re-roofing project completed in May of 2017. With impact-resistant synthetic slate now applied to the 16 buildings, the campus is ready for any future hail storms that may come its way.